Due to the high variety and complexity of service work, it’s often challenging for a single individual to deal with a customer’s request from start to finish. Being passed from person to person can lead to disgruntled customers, while staff can feel demotivated as they rarely get to fully assist a customer themselves. Changing from a silo approach to customer-aligned teams is an effective way to address the challenge. 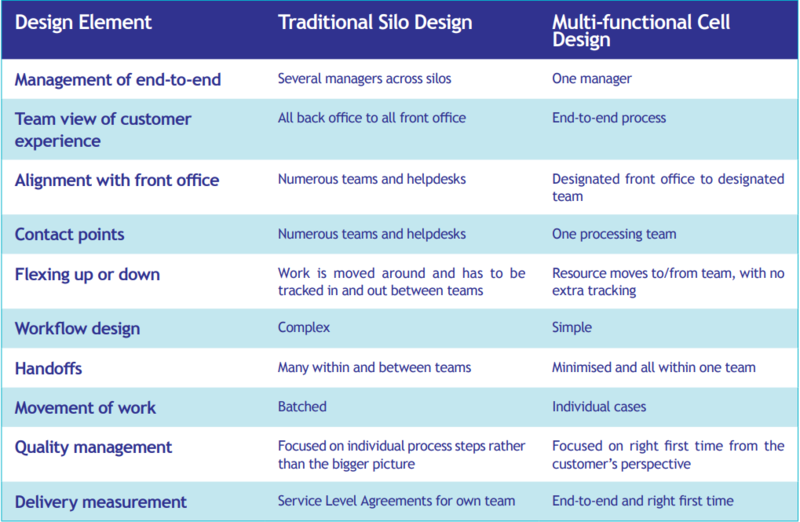 Traditionally, many organisations are designed as silo functions. This involves grouping and managing similar skill sets and processes together, with numerous departments dealing with a single customer’s work request as it’s handed between teams again and again. Not only is this frustrating for customers, it’s difficult to absorb any variety or complexity into such a functionally-aligned operation. The process steps are often interdependent. Furthermore, with so many handoffs involved there’s greater batching, waiting and work in progress. A more effective approach in this environment is to create multi-functional, customer-focused teams who can work together to fulfil the customer’s needs. The following table highlights the key differences between the two approaches. When designing an operation to deliver effective service, customer-focused measures such as end-to-end lead time and right first time are key. As is staff collaboration. The most effective vehicle for delivering this approach is the customer-centric cell. When working in these cells teams are able to solve problems, identify improvements and ensure quality is owned at the point of work.In other words, fewer hand-offs and fewer unhappy customers. Arguably the biggest benefit is that a customer-centric cellular approach provides ownership of the customer’s problem from end-toend. Ensuring the most effective outcome in the most efficient way. Furthermore, the approach still incorporates important Lean tools such as standard operations, team-based problem solving, visual management and skills matrices. Of course, moving from traditional silos to small, customer-focused, multi-functional cells requires a change of thinking. Not to mention an understanding that the perceived economies of scale from a functional organisation can easily be cancelled out by failure demand and an increase in total processing costs. 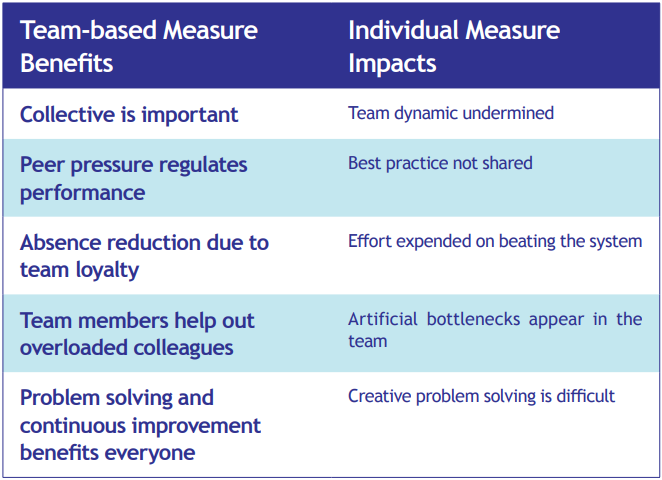 Once customer-aligned teams have been established, it’s best to focus on team based measures rather than individuals. The measures should be designed around the customer requirements and a quality, cost and delivery principle. The measures should also be balanced and aligned to team/individual scorecards, so that the correct behaviours are exhibited in the achievement of the desired customer experience. At OEE Consulting we have extensive experience of transformational change within service environments. We also understand the importance of bringing key stakeholders and customers together to deliver an effective design solution that benefits all parties. It’s why we work with our clients to define and implement the sufficient levels of management support and customer and stakeholder engagement for the wider rollout programme. Our goal is to ensure that every client is self-sufficient in maintaining this customer-centric cellular operation by providing them with effective and practical change management expertise.